This record makes this series more interesting. However, the stats of the points table of the ongoing tournament will change for sure with a fierce battle of Aussies and Proteas. It is nearing to its final. The tri-series is being hosted by West Indies. With each of the three teams winning two games each, they are tied in the points table for now. But, South Africa got an upper hand with a better run rate than the other two. RSA boosted their run rate after thrashing the Caribbean’s by 139 runs. Imran Tahir picked seven wickets in that game. Bowlers especially spinners have a been a crucial part in the series. For SA, Tahir and Tabraiz Shamsi have done an excellent job till now in it. 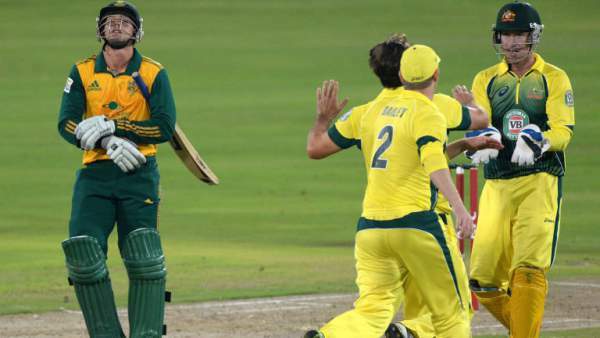 South African coach is confident that his spinners will play a good spell once again against Australia. The pitch at the Barbados will be good for batting in comparison to wicket as per the expectations. There would be three spinners in the playing XI. “We are very fortunate to have a great mixture of spin bowling. Tabraiz Shamsi has come in as a new-comer and gives us the variation as the china-man. Imran Tahir, in my opinion, has shown why he is the number one ODI bowler in world cricket. He has got great variation, he takes wickets and can bowl on any surface, especially when the wickets don’t spin, that is when he is dangerous,” Henderson was quoted as saying by the official website of the ICC. On another hand, Australia’s fast bowler will be their life savior at the bowling end. Aussie speedster has bowled very well so far and put his efforts several times. He is now fit to play in the 7th ODI. “At the moment I’m feeling really good, I’m feeling strong and ready to go at every point. It’s about me getting right for the next game and if that involves playing, that’s lovely. But if it means I have to rest or sit out here and there, I’ll have to cop that on the chin as well,” Starc said. Along with Glenn Maxwell, Starc will also make his comeback against SA. Thus, they should feel more confident while playing against the RSA on Sunday. Aus vs SA is to start at 1 pm local time or 5 pm GMT. Below are the tv listings and live streaming updates and options. In India, the fans can get for Ten 3 and Ten 1 HD for watching it on TV while they can stream it live on Ten Sports Live. Australian audience can go for the live telecast on Fox Sports and have the option to stream it on FoxTel and Cricket Australia Live. While in South Africa, the game will be broadcasted on SuperSport 2. The fan can catch the game live on SuperSport Live video. For the people residing in the UK, they can switch their tv channel to Sky Sports 1. Also, they can watch it on Watch Sky Sports. For the residents of the US, Willow TV will telecast the same. They can stream it on Willow TV Online.